NEW YORK (September 20, 2016)—Effie Worldwide announced today at a special SDG Media Zone event at the opening of the United Nations General Assembly that they established an alliance with PVBLIC Foundation, a media for social change non-profit organization, to further the mission of the United Nations’ 17 Sustainable Development Goals (SDGs) to end poverty, fight inequality and injustice, and tackle climate change by 2030. Effie Worldwide is a nonprofit that champions marketing effectiveness education and is best known for its Effie Awards (Effies) programs in over 40 countries, across five regions. Since 1968, the world’s most recognized brands and agencies have won Effies and measure their performance against Effie benchmarks. Starting with the 2017 North American Effie Awards competition, Effie Worldwide will identify and track marketing efforts that were effective in addressing one or more of the 17 SDGs, starting with its entries, due later this fall. PVBLIC Foundation is a non-profit media organization that harnesses the power of media to drive social change. PVBLIC has amplified media reach across every category; from the White House to the United Nations and nearly 100 non-profits, including #ItsOnUs, #DrinkUp, Change the Course, Greenpeace, Girls Rising, Invisible Children, The Global Poverty Project, OneForAll.org and many others, working at the local, national and global levels. 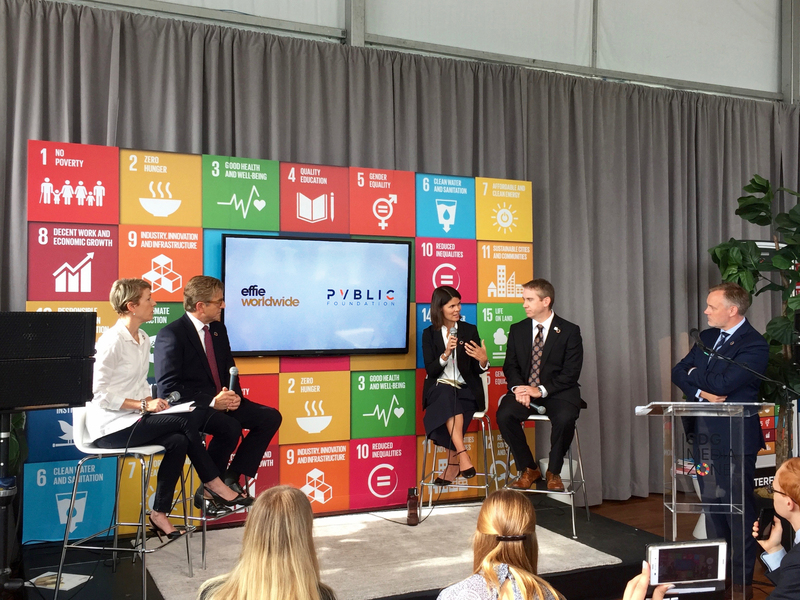 To kick off the alliance, Effie Worldwide led a panel discussion today at the UN SDG Media Zone Tent about the role and responsibility of marketers to address the 17 SDGs and share examples of what marketers are doing now to foster positive change. To intensify the scope of learning on the impact brands are having with their purposeful marketing efforts, Effie Worldwide also announced that it is expanding its Positive Change Effie Awards program, which was founded in 2014 in collaboration with the World Economic Forum. For this year’s competition, social sustainability as well as environmental sustainability cases will be invited to enter under the Positive Change Awards. North America/Europe’s 2017 Call for Entries is open now and the Asia Pacific competition will open in mid-October and run through December 2016. Effie Worldwide is a 501 (c)(3) nonprofit organization championing the practice and practitioners of marketing effectiveness. Effie Worldwide spotlights marketing ideas that work and encourages thoughtful dialogue around the drivers of marketing effectiveness. The Effie network works with some of the top research and media organizations worldwide to bring its audience relevant insights into effective marketing strategy. The Effie Awards are known by advertisers and agencies globally as the pre-eminent award in the industry, and recognize any and all forms of marketing communication that contribute to a brand's success. Since 1968, winning an Effie has become a global symbol of achievement. Today, Effie celebrates effectiveness worldwide with over 45 global, regional and national programs across Asia-Pacific, Europe, Latin America, Middle East/North Africa and North America. Effie initiatives include the Effie Effectiveness Index, ranking the most effective companies and brands globally and the Effie Case Database. For more details, visit www.effie.org. Follow @effieawards on Twitter and on Facebook.com/effieawards for updates on Effie information, programs and news. On January 1, 2016, the 17 Sustainable Development Goals (SDGs) of the 2030 Agenda for Sustainable Development — adopted by world leaders in September 2015 at an historic UN Summit — officially came into force. Over the next fifteen years, with these new Goals that universally apply to all, countries will mobilize efforts to end all forms of poverty, fight inequalities and tackle climate change, while ensuring that no one is left behind.